South Korea police are investigating the mother of Korean Air's "nut rage" heiress for physically assaulting employees and smuggling goods into the country. Lee Myung-hee, 69, has been at the center of a national uproar following the release of video footage showing a woman erupting in a temper tantrum at a construction site in 2014. The defendant was later identified by multiple victims as Lee. The chairwoman of Hanjin conglomerate's nonprofit Ilwoo Foundation may have injured her victims during one of her assaults, according to local press reports. She is also suspected of smuggling swans into South Korea to a Hanjin-owned farm on the resort island of Jeju, South Korean television network SBS reported Monday. South Korea's customs service is investigating the swans and other confiscated goods in order to find out how Lee evaded authorities and how she paid taxes on the smuggled commodities. The agency is recovering Lee's deleted emails and could also summon the Cho family, including Cho Yang-ho, Hanjin's chairman, as well as Cho Hyun-min, who recently apologized for throwing a water bottle during a meeting. Hanjin Group is the holding company for Korean Air and Hanjin Shipping. Cho Hyun-min's sister Cho Hyun-ah, 44, was the Korean Air executive who created an uproar after leaving an employee stranded on the tarmac of a New York airport following a dispute over macadamia nuts. The antics of the Cho family have riled Korean Air employees. They held a candlelight rally in central Seoul Friday. 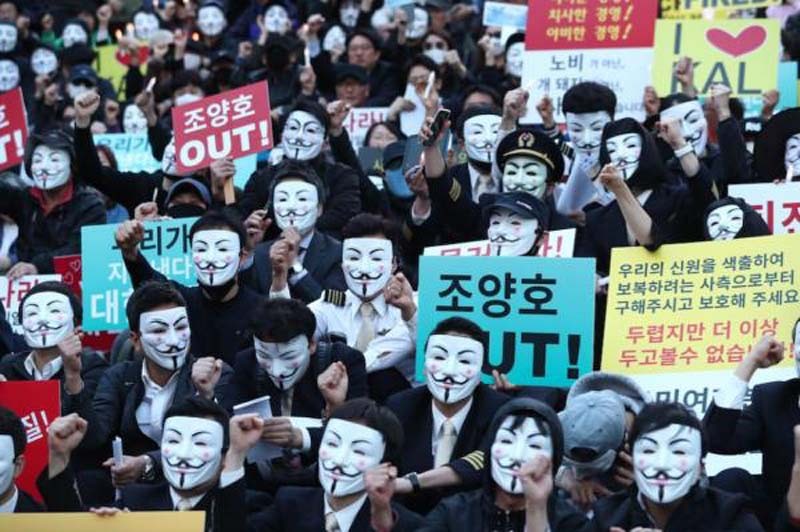 South Korean television network JTBC reported the employees assembled wearing Guy Fawkes masks for fear of retribution from the Chos. Park Chang-jin, the former Korean Air employee who was verbally attacked then stranded in New York in 2014, has said his civil lawsuit filed against Cho Hyun-ah resulted in retribution at the workplace. Park has said he was demoted and ostracized.